(01/06/2010) The level of the illegal trade and smuggling of the protected wildlife in Indonesia in 2009 is quite high. ProFauna's Indonesia latest survey recorded that 70 animal (bird) markets in Java Island traded 183 protected species. Among the 70 markets which were located in 58 different cities, 14 of them sold parrots, 21markets sold primates, 11 markets sold mammals, and 13 markets sold raptors. Besides those target species, protected singing birds were also sold in 11 markets. The Province which traded protected species the most was East Java. While the city that sold the protected species at the majority was Solo, Central Java in Depok bird market. The second place was Ambarawa city. The large markets in Surabaya, Semarang, and Jakarta sold protected species in discreet manners where traders did not display the animals openly but hid the wildlife in their stock houses or resident houses instead. The illegal trade of wildlife not only happened in Java but also in other islands of Sumatera and Bali. The authorities should pay more attention to the rampant trade in Palembang city in Sumatera. The hub was located in 16 Ilir market selling many endangered species like eagles, siamangs, langurs, slow lorises, pangolins, etc. Palembang was also notorious as the centre of pangolin trade in Sumatera. Especially for Bali Island, the striking wildlife case was the endangered sea turtle. Despite the sharp decrease compared to the trade before 2000, the sea turtle smuggling has been still going on secretly. One of the cases which had been revealed by the authorities was when they foiled the smuggling of seven sea turtles into Bali on 30 May 2009. ProFauna also recorded that there are at least six places that keep sea turtles illegally in the name of eco-tourism, centred in Tanjung Benoa region. This shows that Bali is still the main destination of sea turtle trade in Indonesia. In 2009, the Governor of Bali controversially proposed 1,000 catching quota for sea turtles for traditional and religious ceremonies. The proposal was contrary to the government of Bali efforts to build Bali's image as an eco-friendly tourism destination. This quota proposal has also violated the wildlife act which enlists all sea turtles in Indonesia as protected species. Along 2009, ProFauna had monitored some locations that were alleged as the international exits of wildlife smuggling. They were Soekarno Hatta airport in Jakarta, Ngurah Rai airport in Bali, and Talaud Islands in Sulawesi. On 8 March 2009, two Arabs were arrested for smuggling dozens of endangered species through Sukarno Hatta airport in Jakarta. Months later, on 2 October 2009, 16 eagles were about to be smuggled to Japan through Ngurah Rai airport in Bali. While on the North=East of Indonesia, Talaud Islands became the exit points to smuggle Indonesian wildlife to the Philippines by sea transportations. On 8 January 2009, the local authorities confiscated 234 species which were going to be smuggled to the Philippines. Previously in 2008, ProFauna launched a report called Pirated Parrots revealing thousands of Indonesian parrots smuggled to the Philippines through Talaud Islands. 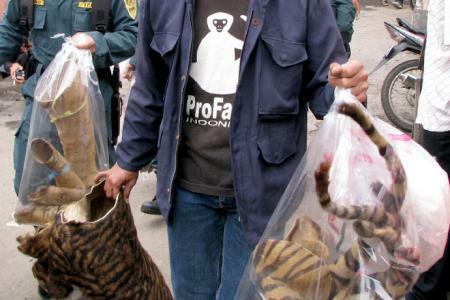 Even though numbers of wildlife trade and smuggling remained high, operations by the authorities (police, forestry, and custom) on the crime increased in 2009. ProFauna recorded that there were 53 wildlife crimes enforced by the authorities. ProFauna estimates that the value saved from the cases worth 10 billions IDR (1 million USD). ProFauna applauds the Indonesian Police which have been operated on 27 wildlife crimes or 51% of all cases. ProFauna also sees that the Police take serious actions on some regions like in East Java, Bali, and Jakarta. However, the authorities in other regions do not take wildlife crimes as serious offences. The authorities seized many mammals like pangolins, tiger parts and primates at the majority in 2009. The runner-up was the marine biota, smuggled to China, Hong Kong, and European countries. At the third place was sea turtle and parrots were at the fourth. 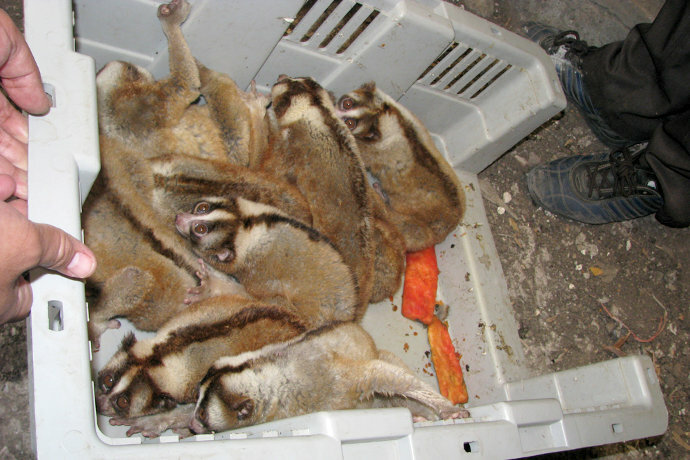 Along 2009, ProFauna had received 36 reports of wildlife exploitation from the public. Most cases happened in Java. The second places were Bali and Sumatera. These public reports show their increasing awareness on the protection of wildlife and their habitats. The illegal wildlife trade violates the 1990 Wildlife Act concerning the Conservations of the Natural Resources and the Ecosystems. Offenders are liable to a maximum five-year prison term and 100 millions IDR (10,000 USD). However, this law is not fully enforced as the trade still happens openly in many places in Indonesia. Illegal wildlife trade poses serious threat toward wildlife in the wild because most of the traded animals are wild-caught. Threaten by extinction, Indonesian wildlife also decreases because of habitat loss and degradation. ProFauna considers that wildlife trade should be taken seriously as a national issue. Authorities should work together effectively to tackle the crimes.